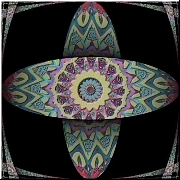 ABSTRACT DIGITAL ARTWORK. This image is formed from small overlapping strips of "leather" in strong, brilliant shades of scarlet, tangerine, verimilion, like green, gold, ivory, cobalt blue, and a darker green, with just a hint of violet here in there. 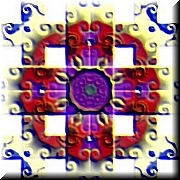 The central image is a small four armed version of a flattened cross in old gold on a square of green surrounded by violet. The central cross is slightly raised. This cross is surrounded by a ring of white and pale violet on a lime green background. The arms are made from squares in tangerine and scarlet. The outer ribbons have toucheds of gold. The background is purple, with corner details in a darker green with touches of violet and gold. DIGITAL ARTWORK. 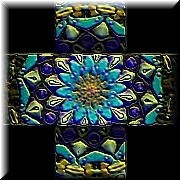 A lovely cross made from brocade ribbons in shades of aqua, cobalt blue, gold, and silver. DIGITAL ARTWORK. An elaborate cross in platinum on a background of garnet-colored "satin." Ancient cross in red and gold. DIGITAL CROSS. 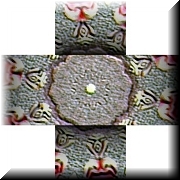 Red and gold "stone" cross on a platinum background. DIGITAL CROSSES. Stone crosses in southwestern tints of rose, pale violet, pale aqua, teal, and light yellow. DIGITAL CROSS. 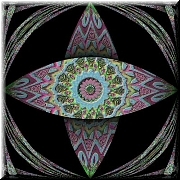 A cross sculpted in "stone" in pale pink, green, and purple on a black background. Blue embossed crosses in five shades of blue. DIGITAL CROSS. 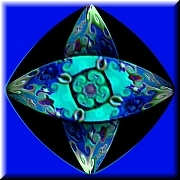 3D cross in aqua, cobalt, with an indigo center, framed in royal blue "enamel."